For the third quarter of 2013 KIA Motors (UK) Limited has unveiled a range of deals making its 7 year warranted cars even better value than they were before. The popular Picanto city car has up to £1,250 off the retail price, there's up to £1,400 off the KIA Rio hatchback and up to £1,600 off the KIA Venga B-segment MPV, whilst the new KIA Sorento SUV has a customer saving of £2,000 off all versions. Savings on the New KIA cee'd and New KIA cee'd Sportswagon are generous too with up to a £1,000 discount for new customers whilst existing Kia customers are entitled to a loyalty reward of up to £3,000 in lieu of all other offers. To make getting into a new KIA even easier there's 4.9 per cent PCP from KIA Access, as well as 4.9 per cent Conditional Sale finance, across the entire range and even zero per cent finance available on Venga and Soul models. Further enhancing the KIA Access PCP promotion, the entire cee'd family range, including the new KIA pro_cee'd GT are eligible for a £1,000 deposit contribution. 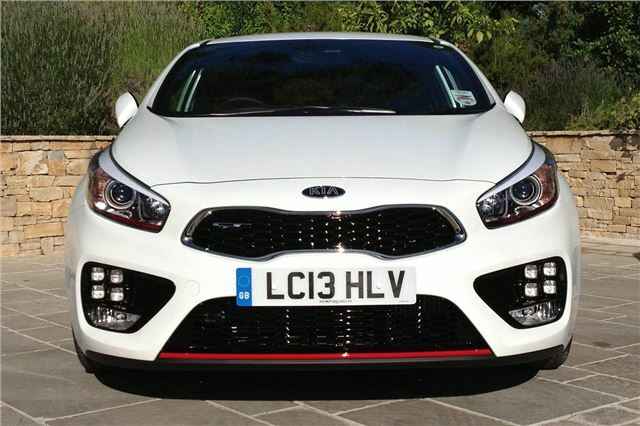 KIA's new high performance 3-door pro_cee'd GT has just been launched, for drivers who want great looks with the performance of a hot hatch yet decent refinement, available in three specifications 'GT', 'GT Tech' and a limited number of 50 'GT 1st Editions'. All have a turbocharged GDi petrol engine with 201bhp and acceleration from 0-60mph in 7.4 seconds. With pricing starting from £19,995 the pro_cee'd GT is the perfect combination of refinement, design and value. A year's insurance is available for just £99 on selected Picanto, Rio and cee'd models - an offer that can be combined with the other savings and finance deals on offer. Unlike similar insurance offers this promotion is open to all parts of the United Kingdom - including both Northern Ireland and the Channel Islands. The Picanto 3-door 'City', Picanto 5-door '1 Air', Rio '2' models, New cee'd '1' and New cee'd Sportswagon '1' are all eligible for the insurance offer. The popular KIA Picanto 5-door '1 Air' is now on offer from £8,495 - after a £350 saving - with a year's insurance for £99 and the low rate 4.9 per cent Kia Access or Conditional Sale finance offers. The well specced Picanto 3-door 'City' is also available for just £8,995 with a £1,250 saving and the £99 insurance offer. Kia's all-inclusive servicing plan, Care-3, is available on all Picantos and covers the first three services for just £299, helping to keep running costs even lower. KIA Rio, in '2' specification, comes with a £1,400 saving - meaning that a Rio '2' starts from just £10,495 - as well as a year's insurance for £99 and 4.9 per cent KIA Access PCP or Conditional Sale finance offers are available. Kia's all-inclusive servicing plan, Care-3, is available on all Rios and covers the first three services for just £299. The newly launched KIA Carens 7-seat MPV is on offer with a range of customer offers; a £1,000 customer saving and all derivatives are available with 4.9 per cent Kia Access PCP and Conditional Sale finance offers. Current KIA owners can get £2,500 of the Carens '1' and '2' grades and £3,000 off the top spec '3' models meaning that the Carens is available from just £15,395. Finally, the New KIA cee'd and New KIA cee'd Sportswagon in '1' specification are both eligible for a £900 saving resulting in prices from £13,500 for the cee'd '1' 1.4-litre petrol and £15,995 for the cee'd Sportswagon '1' 1.4-litre CRDi diesel. Both variants are eligible for the 4.9 per cent KIA Access PCP with £1,000 deposit contribution, or 4.9% finance offer, as well as the year's insurance for £99 offer. New to the KIA cee'd Sportswagon line-up is the 1.6 CRDi '3' automatic, priced at £21,200 including a £1,000 customer saving, the model is available in dealerships from late July. The entire cee'd range is available with the Care-3 all-inclusive servicing plan that offers the first three services for a fixed £329 and, as with every new Kia, the cee'd range comes with Kia's industry-leading seven year warranty.